The elections of 2008 are still more than a year away, but the race for the presidency is already in full swing. Scores of candidates are already traveling the nation, delivering stump speeches, shaking hands, and making blatant appeals to the rich and powerful for enormous campaign contributions. And yet, in the middle of the feverish display of Athenian-style democracy, something sinister is at work, something malicious and ugly, kept hidden underneath a shadowy shroud of conspiracy…. And that something is Mitt Romney. 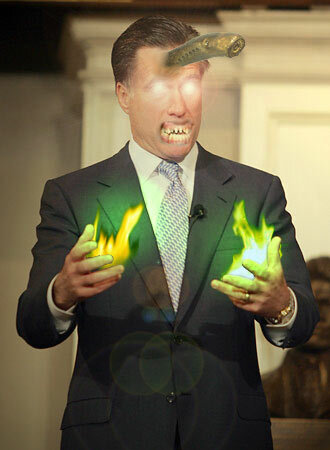 While it’s too early to be certain of the details behind Romney’s return, we at JREZHS speculate that this “Mitt Romney” is none other than a genetically engineered, pre-programmed, forced-growth clone, complete with cybernetic modifications for enhanced strength and speed. Or possibly just a body double. We don’t know. In any case, what makes this situation even more suspicious is the fact that Romney’s primary contributor appears to be none other than the Mantron Corporation – responsible for donations in excess of 100 billion dollars. The Mantron Corporation is definitely up to something, but what their plan might be and how it is connected to similarity between Yodels and HoHos is uncertain. But never fear! We at JREZHS vow to remains as alert and as vigilant as ever! Y’know…When we’re not working on our Hollywood movie adaptation or anything….